As we reported yesterday, Steven Universe will return on July 18 for another 4-week event. But this time, a new episode will air each weeknight for that month, providing a veritable treasure trove of Crystal Gems. That’s been confirmed by Entertainment Weekly, which also reveals that there will be a new Gem in town—er, Beach City. In this teaser for the upcoming episode, “Everything’s Changing,” we meet Bismuth, an old comrade of the Gems who’s shocked to see the post-Rebellion (as in the Gem War) Earth. 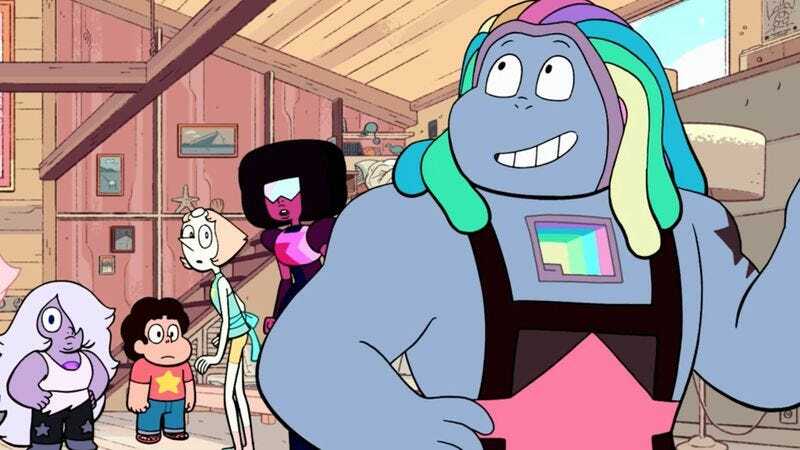 Orange Is The New Black’s Uzo Aduba voices Bismuth in the 22-minute special that will air toward the end of the summer of Steven. All told, there will be 20 new episodes between July 18 and August 12, one of which will be the all-musical episode, “Mr. Greg.” Cartoon Network has also shared a sneak peek at that episode, so you can check out the Universes living the high life in Empire City below.